London-based game outfit Mind Candy, the maker of an insanely popular virtual world for kids, made a significant move on Monday — buying another British studio, Origami Blue. While MindCandy has bought IP before, this marks the first company-sized acquisition for hotly-tipped startup, and an interesting one too. Origami Blue was formed by refugees from Disney’s Black Rock studio, which was closed down in 2011. But although Black Rock specialized in racing games like MotoGP, it seems that Mind Candy is buying it for work they’ve since been doing on augmented reality applications and animation. The company said in a statement that the OB team would become the engine behind a new experimental development arm it’s calling “Candy Labs”. But it looks like the company’s ambitions don’t end with a single purchase. A recent job listing for a manager to work on M&A suggests that the company is looking for more than just the odd tumble — and may be at the start of a serious acquisition spree. The ad, which ran a couple of months ago, suggests that more buyouts could be on the way. It’s a big step from the company not least because it hints at an apparently strong financial position — achieved despite relatively modest venture funding from big names like Index and Accel. While its last audited accounts show £1.2 million of profit on revenues of £7.5 million (that’s $1.8 million on $11.6 million), they go back to the end of 2010. Since then, the company has increased its user base to around 75 million people globally, and last year Spark Ventures cashed out in a move that valued the company at $200 million. 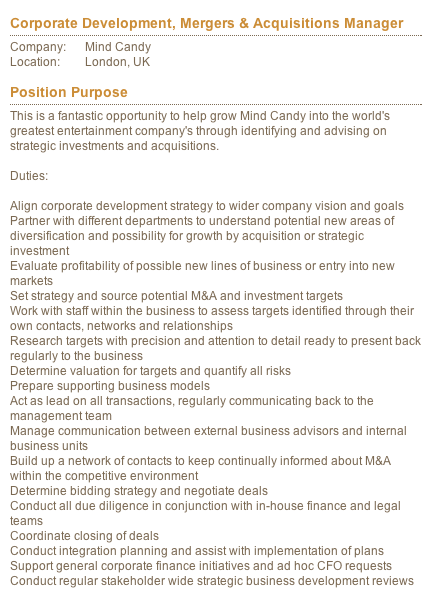 In the meantime, Mind Candy boss Michael Acton Smith says “”our valuation is now substantially higher than that” and the business has been talked up as a potential IPO candidate. Side note: interestingly one of Moshi’s biggest competitors, Club Penguin, (which is also owned by Disney) has its UK headquarters just a stone’s throw from Origami Blue’s offices. A manager of corporate development is not a senior M&A position. For this article to call it a “head” should be at the vice-president level. This person will have, once hired, as much power and authority as a marketing manager or a project manager. Which as you know, is well below that of a director.